Finding the right template for your website can be seriously tricky, no matter what kind of a website you are making. If you are running a restaurant, you want your website to fit your restaurant’s style perfectly, plus of course you want it to function properly. Joomla Monster is a developer that creates quality, functional restaurant templates for Joomla. As a restaurant owner, you surely don’t have any extra time on your hands so you can mess around with your website and spend hours creating it. The guys at JoomlaMonster know this, and they do their best to create templates that are easy to handle. You won’t even need to hire anyone for professional help, these templates will make it very easy for you to do everything all by yourself. You will be able to install an exact copy of a finished demo site, and then all you have to do is replace the data with your own and save tons of time. 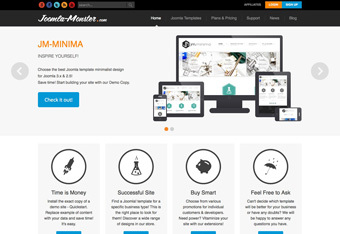 The templates at Joomla Monster are created for specific niches. If you own a restaurant, you won’t have to settle with a generic template that covers a wide range of niches but doesn’t really fulfill your needs. Instead, you will get a proper restaurant template created specifically for your niche with all the tools and option a restaurant website needs. Why settle for less when you can have it all, right? The flexibility of Joomla Monster templates makes them highly recommendable, and this developer knows how you guys like getting stuff for less money, so they organize various promotions for individual customers and developers. A great customer support is a big plus because you no longer have to worry about not getting help in a due time – these guys are there for you as soon as you need them.